Did Trump just destroy NATO? If so, should we care? President Trump speaks at a press conference on the second day of the NATO Summit in Brussels, Belgium, on July 12, 2018. 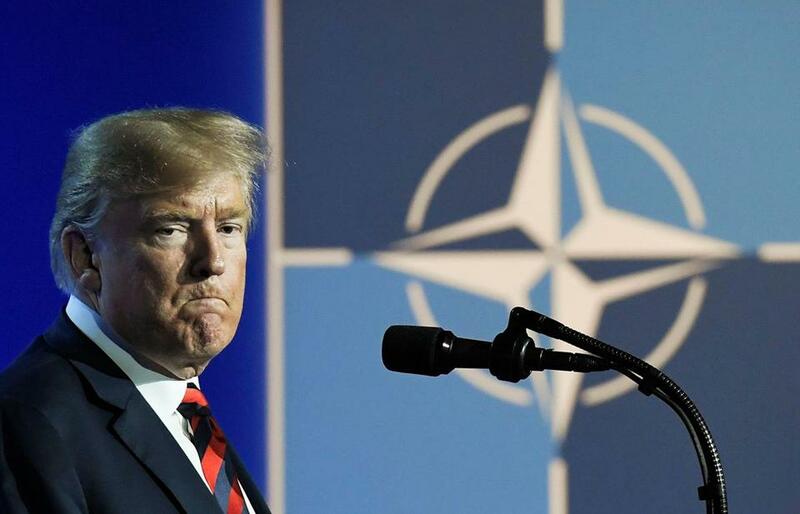 President Trump is attracting the usual objections after scolding our NATO allies in Europe as cheapskates recently and heaping praise upon the Russian president in their summit Monday. Some say no president in the modern era has so abruptly alienated America’s allies or appeased its enemies. What certainly is unprecedented is Trump’s exhibitionist style of diplomacy. Full of public displays of affection and aggression, this approach has allies and adversaries doubting the health of the transatlantic alliance. But after watching Trump’s meetings in Brussels and Helsinki, the question to ask is not whether Trump will cause NATO’s breakup, but whether he effectively already has. Europeans doubt Trump’s commitment to Article 5. But Trump doubts Europeans’ commitment to the less famous Article 3 (which commits allies to “maintain and develop their individual and collective capacity to resist armed attack”). The intensity of this mutual distrust might have already rendered NATO null. Public opinion polls show stable American support for NATO, but it’s unclear whether the American people are truly prepared to “treat an armed attack on Latvia as an invasion of Louisiana,” as my colleague Ian Bremmer has written. Public support for NATO hinges on whether American taxpayers think it vital for their own national security — an increasingly difficult proposition. Western political leaders have failed to articulate a clear mission for NATO since the Soviet Union collapsed. Recently, NATO’s role has been muddled. Apart from several humanitarian interventions and anti-piracy patrols, NATO’s only major activity has been counterterror operations in Afghanistan, which the United States could easily have undertaken alone. Despite the relative weakness of post-Soviet Russia, NATO continues to expand eastward. NATO enlargement has had the perverse effect of triggering Russian aggression in Eastern Europe, as Vladimir Putin seeks to head off what he sees as Western encroachments upon Russia’s border. Some argue NATO expansion has backfired, weakening rather than strengthening America’s national security — unlike during the Cold War, the alliance may be making war with Russia more, not less, likely. It has also curtailed democratization within Russia itself, as Brookings Institution scholar Michael O’Hanlon observes, “providing a pretext for hyper-nationalists to oppose liberalism and reform.” President George H.W. Bush considered expanding NATO to include Russia thereby creating incentives for a more democratic and open Russia. But the idea was opposed by the Europeans who wanted to keep pressure on their neighbor to the east. Russia, though increasingly aggressive, is not militarily or economically powerful enough to threaten the United States or its wealthy Western European allies, and so it’s hard to make the case that efforts to extend NATO have been tightly aligned with America’s national security interests. In fact, the real threat to European democracy and unity comes not from Russia but from within the West itself, in the form of ascendant hyper-nationalist parties determined to break up the European Union, cut off freedom of movement and commerce, and limit the independence of democratic institutions like the judiciary and the press. Some members of this new “populist internationale,” such as Hungary’s Fidesz, Poland’s Law and Justice, and Italy’s Northern League, have already succeeded in taking power. France’s National Front and the Alternative for Germany continue to gain strength. This is a threat emerging within NATO countries, not outside them. Trump’s waffling over Article 5 is perhaps less concerning than his and his officials’ open praise for these hyper-nationalist parties and their policies. Even though NATO’s raison d’etre has receded into history’s rearview mirror, and even as its credibility is waning due to shifting interests among its members and gaps in the perceived threat posed by Russia, the alliance will probably survive the Trump presidency bruised, not broken. But that’s somewhat beside the point. European democracy and unity is facing new threats in the post-Cold War era. The president berating allies to spend more on their own defense and wavering over NATO’s relevance is likely not as destabilizing to Europe as the rapid rise of these nationalist political movements. They pose a threat against which any military alliance is powerless.